“We are witnessing an energy transformation taking hold around the world, and this is reflected in another year of record breaking additions in new renewable energy capacity,” said IRENA Director-General Adnan Amin during a press release. “This growth in deployment emphasizes the increasingly strong business case for renewables which also have multiple socio-economic benefits in terms of fueling economic growth, creating jobs and improving human welfare and the environment,” he added. Historically, hydropower has been dominating renewable energy technology across the world. 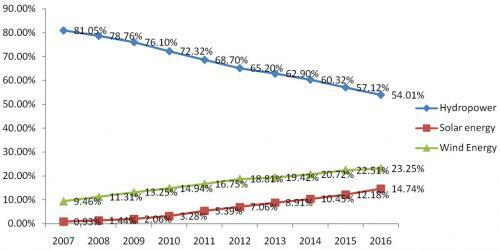 Till date, it holds the highest share of installed capacity in renewable energy. However, hydropower sector is slowing down. Its compounded annual growth rate of installation for the last 10 years has been a little over three per cent. As compared to 2015, there was only 30 GW of additional capacity in 2016, a slight 2.8 per cent increase. The growth in renewable energy in the last decade has been driven by wind and solar sectors. Solar’s compounded annual growth rate has been around 42 per cent in this period. The sector has grown from 9.16 GW in 2007 to almost 296 GW in 2016. In 2016 alone, 71 GW of solar power was installed. Of this, only 210 MW was based on the concentrated solar technology while the remainder used solar photovoltaic technology. Similarly for wind sector, the compounded annual growth rate has been around 18 per cent. Around 50 GW of wind capacity was installed in 2016, which was a dip in comparison to installation of over 65 GW in 2015. Onshore wind saw the bulk of installation as off-shore farms are still considered comparatively expensive. Last year was exceptional for India’s renewable energy, particularly the solar sector. The country also touched the 10-GW-landmark for solar energy in March 2017. In 2016, India had a total installed capacity of 90.75 GW of renewable energy. 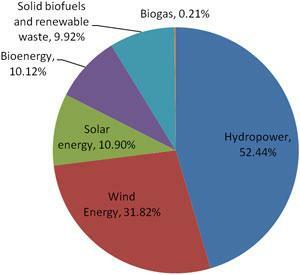 Hydropower dominates the sector, being the oldest technology of power generation. Following the global trend, wind and solar power saw giant leaps forward in terms of installation. Solar energy grew from 5.5 GW in 2015 to 9.89 GW in 2016, a growth of 45 per cent. Wind sector saw an installation of 3.79 GW of installation a growth of 13 per cent from 2015. However, installed capacity does not necessarily mean electricity generation. In India for instance, many wind developers have been asked not to feed power, due to excess generation and lack of space in the grid. This happened so frequently in case of solar projects that Ministry of New and Renewable Energy had to issue a notification binding Load Dispatch Centre to buy power when a renewable energy plant supplies it.